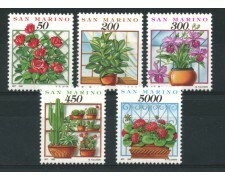 26/03/1992 - SAN MARINO - Cose Gesti e Affetti di ogni giorno (Cat. Unificato N° 1338/1342) Serie completa di 5 valori Nuovi con gomma integra originale. 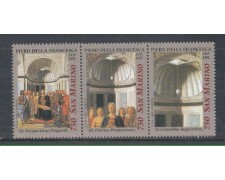 1992 - SAN MARINO - NATALE - 5° CENTENARIO DELLA MORTE DI PERO DELLA FRANCESCA (UNIF.SASS.1363/1365) TRITTICO NUOVO GOMMA INTEGRA ORIGINALE. 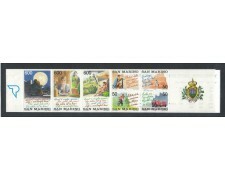 1992 - SAN MARINO - MOSTRA MICOLOGICA (UNIF.SASS.1359/1362 - YVERT. 1307/1310) SERIE COMPLETA 4v. NUOVI GOMMA INTEGRA ORIGINALE - 2 COPPIE. 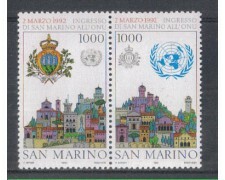 1992 SAN MARINO - Admission to the UN - Complete Series 2 values ​​together - original gum - Never hinged. 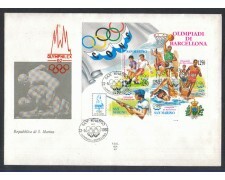 1992 - SAN MARINO - OLIMPIADI DI BARCELLONA (UNIF.BF/46 - SASS. BF/35) FDC (ALA). 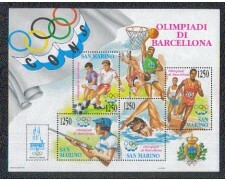 1992 - SAN MARINO - OLIMPIADI DI BARCELLONA (UNIF/BF.46 - SASS. BF.35) FOGLIETTO NUOVO GOMMA INTEGRA ORIGINALE. 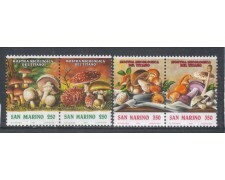 1992 - SAN MARINO - ATTRATTIVE TURISTICHE LIBRETTO (UNIF.SASS. L/3) NUOVO GOMMA INTEGRA ORIGINALE. 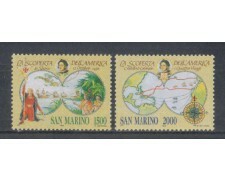 1992 - SAN MARINO - CELEBRAZIONI COLOMBIANE 3° EMISSIONE (UNIF.SASS.1334/1335) SERIE COMPLETA 2v. NUOVI GOMMA INTEGRA ORIGINALE.